If you are searching for Huatulco vacation homes , you may have just found a small slice of heaven on earth. Salchi Bay is one of the best kept Huatulco secrets as Huatulco is on its way in becoming more popular - especially for those searching for a Huatulco vacation home away from home. Huatulco has a little of everything for everyone, there are 9 bays in Hutalco and each bay offers a little different experience. Having purchased a Huatulco Vacation home in Salchi Bay myself , I can share with you that it is not like anywhere else. My family searched all of Mexico, most of the Carribean before we purchased our vacation home in Salchi Bay. We wanted a home that was isolated but we also wanted a sense of community. We wanted neighbours and friends we could grow with. Seeing the ocean was a must , and a close airport was also a priority. We found it all in Salchi Bay. The beach at Salchi Bay is amazing, and just take a look at this susnet - they are truly the best from the Pacific. Salchi Bay " A Little Piece of Paradise "
Welcome to beautiful Salchi Bay located in Oaxaca, Mexico . Once you arrive in Mexico, Salchi Bay is 19kms, or a short 15-20 minute drive west from the International Huatulco Airport, and a short drive to town for groceries, wonderful restaurants, nightlife, world class golf, a marina, and other many other tourist attractions. Below you will find a picture of the Huatulco Marina and a picture of the square over Christmas in downtown Huatulco. Salchi Bay is nestled in one of Huatulco bays that offer clear blue/green ocean and a secluded and private beach. 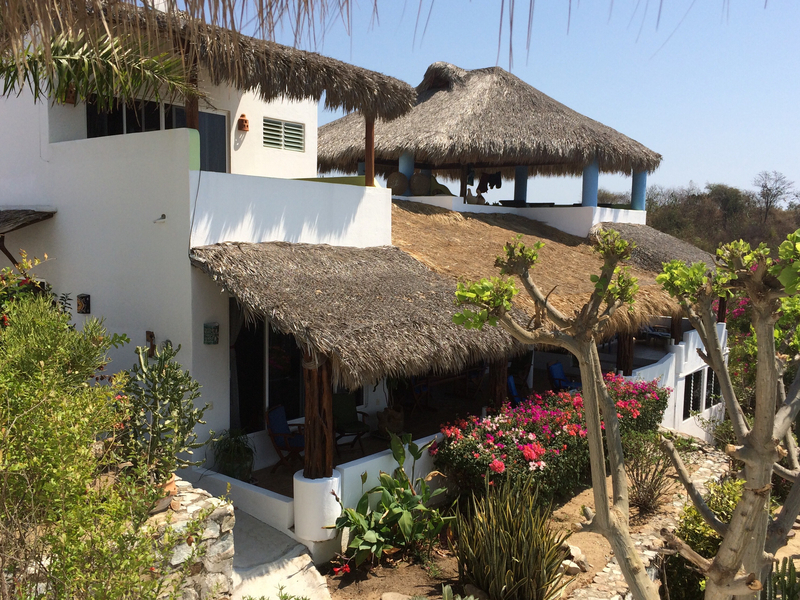 Vacation homes is Salchi Bay have the old Mexican charm and the area is immersed in Mexican culture. A safe, but not gated community, of 37 homes on a stunningly beautiful bay with a pure white sand beach. A strong "Homeowners Association" that continues to improve the infrastructure, that includes a deep well, government approved septic system,and safe and well lit concrete pathways. Homeowners enjoy weekly maid and gardener service, led by a professional English speaking manager year round. The almost 85% Canadian owner base (3 American & 3 Mexican), are treated as friends and neighbours by the locals. This is due largely from the efforts to further education, and help build schools, with the aide of the Canadian based Contigo Foundation whose founders and directors are all owners in Salchi Bay. Salchi Bay is a cozy hidden treasure that offers privacy and peace to home owners, while you take in all that the area has to offer without the hustle and bustle of everyday life. Sit on your first class Mexican designed, open air patio mesmerized by the Pacific Ocean waves crashing onto the beach only steps away from your front door. click here for full listing details and more information.